The AAUP weren’t talking about Yale itself, but somewhere far east, GMT+8 east, so that yet others thought the Yale faculty who had come forwards then to express concern “carried a sense of [Western] moral superiority”. 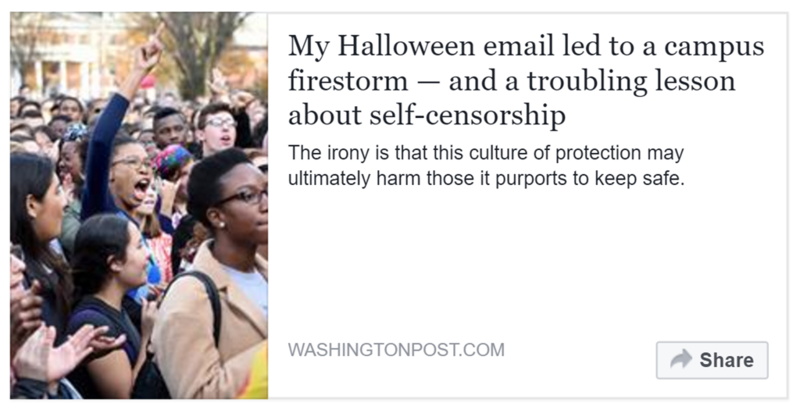 Last year, a then Yale faculty member set off a firestorm when she emailed the University to urge a critical reflection on its official guidelines of Halloween garb that might offend, and thus that should be avoided. Instead of generating a public conversation on civic convention, overweening authority, individual responsibility, a sense of balance and moderation, or indeed just plain common sense, that email drew withering criticism of the author. The email was labelled racist, and accused of inciting violence. A thousand Yale students, faculty, and university officials called for the author and her husband to be removed from campus. The author writes “Some asked for […] advance warning of my appearances in the dining hall so that students accusing me of fostering violence wouldn’t be disturbed by the sight of me. One should indeed worry how liberal discourse in academia is under threat. It is indeed appropriate to fret about unreasonable infringement on the freedom of speech. Students should indeed learn to not fear failure in the practice of thinking out loud. The danger otherwise to intellectual and moral growth is indeed grave. Free speech is precious and valuable, and comes bundled with subtle rights, responsibilities, and burdens. No one should take free speech for granted, just as all should be aware how economics – and indeed logic alone – compels sympathy and understanding for how different societies place themselves on different points of tradeoff, varying with that society’s possibilities and needs. It is invidious and hypocritical, however, to craft one set of noble rules by which a foreign society is judged, and then yet a different set of rules by which one judges oneself. The danger that AAUP warned about turns out to come not from where, a mere four years ago, Yale’s faculty thought it might. It’s come instead from within.